The underground city of Aydıntepe is 2-2.5 meters below the surface. The underground city of Aydıntepe in Turkey's Bayburt province, which was discovered by chance during construction, is one of the most important historical structures in the city. The underground city, which is 2-2.5 meters below the surface, consists of galleries – rooms carved into the main rock without any building material – and larger halls to which these rooms open. The rooms, which are about one meter in width, are generally opened to the galleries, which are 2 meters in height, while these galleries opened to the large halls. The ceilings of the galleries, which are more than 1 kilometer in length, have conical holes, which are thought to be for surveillance or ventilation. In Aydıntepe city center, the underground city beneath houses, offices and streets draws attention as the most important cultural and historical value of Bayburt and mesmerizes visitors with its mystery of thousands of years. District Governor Mustafa Akın told Anadolu Agency (AA) that Aydıntepe has come to the forefront with its historical and natural beauty in recent years. Explaining that the underground city of Aydıntepe is one of the most important landmarks in the historical area in Bayburt, Akın noted that 15,500 people had a chance to see the underground city in 2018. Akın said that the underground city has a splendid, historical pattern and added, "How the rock is carved for the creation of that work, how this structure was built by hand will astound people. Thus, I invite all of our citizens to see the underground city of Aydıntepe." The unearthed part of the underground city is just the tip of the iceberg, Akın continued. "Detailed research continues. There are some rumors saying that the underground city of Aydıntepe reaches from here to Bayburt Castle. The investigations are sustained by the Ministry of Culture and Tourism. When this work is completed, I believe that the underground city will be an important attraction center for our region and Turkey." Akın reported that the underground city route could be completed in about 15 minutes in its present condition. "Inside the underground city, there are some galleries where you need to watch your head when entering. The 800-meter part, which is open now, is located under the district center. It is a part that we found during construction by chance. The other parts will be searched by ground-penetrating radar (GPR). A project about lighting the unearthed part, prepared by the Provincial Directorate of Culture and Tourism, has been presented to the Erzurum Regional Board for Cultural Heritage Preservation Board. When they are completed, we will observe this historical place much better," he said. 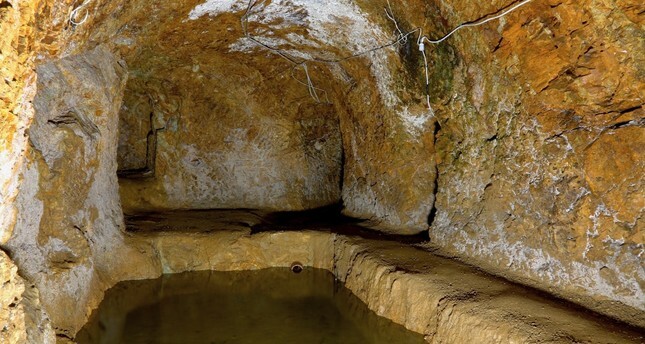 Akın said that there is no problem about the durability of the underground city of Aydıntepe, which is located under houses, shops and streets in the district center and that some precautions should be still taken for its preservation. "We do not have a problem with the durability of this place as it was carved by hand. However, there is a settlement over it, and it can create risk in the long term. A preservation plan is being prepared now," the district governor concluded.